WASRC and other affiliated organizations sponsor Special Clinics and Events that supplement the training of its Members. To register for a Special Clinic or Event, log in to the WASRC website to register for these special clinics or events. From the Member Information Page, select “Register for a Clinic or Fitness Test” from the I want to dropdown. The Member Categories page will then be displayed. Complete the Convictions option by selecting Yes or No. In the Select Registration Categories select the category that is appropriate for the Clinic in which you wish to register. Uncheck those that do not apply. The Categories that you have checked will be displayed in subsequent boxes. If you have left the Referee category checked, the following box will be displayed. To have a Special Clinic displayed, select the Supplemental Training option. Click the [Submit Categories] button at the bottom of the page. You will be returned to the Member Information Page. In this example we will scroll down to the Referee Registration Type and view any available clinics. In this example we will want to register for the Referee – Intermediate (8+) clinic. 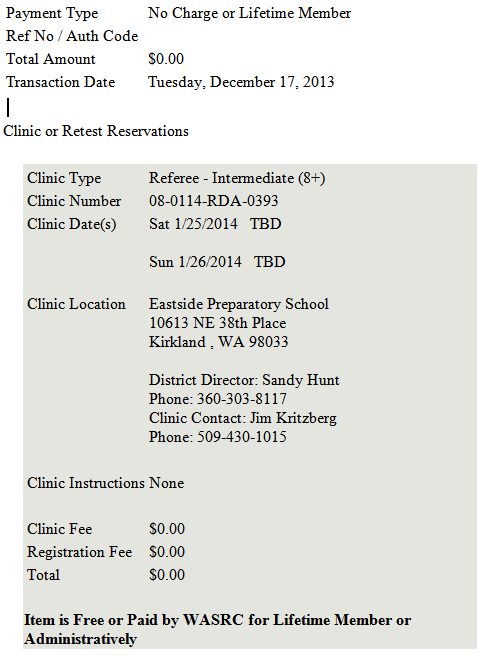 Click the [Reserve Clinic] button to register for the clinic. The Clinic will now show the “Checkout Required” status. 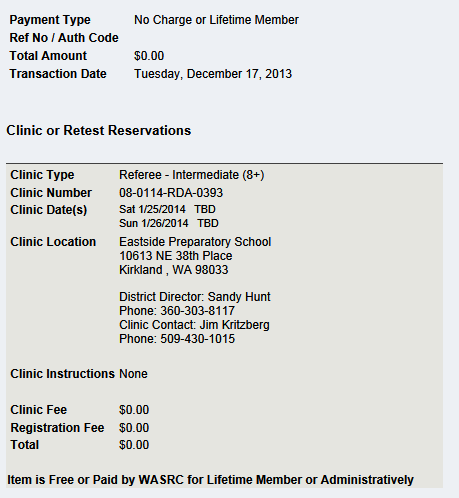 Your Fee Items box will now show that you are registered for the clinic (without a Fee). If this is not the clinic you wanted, click the [Remove Item] link. The next step is to complete the registration by clicking the [CHECKOUT: …] button at the bottom of the Fee area. Clicking this button is required to complete the registration. The Member Receipt will be displayed. In this instance, there is no fee. Click the [Return to Member Info Page] button to complete the transaction. Scroll down to view your registration status as Reserved. You will also receive an email confirming your registration similar to the online confirmation displayed above.